Stochastic Constraint Satisfaction Problems (SCSPs) are a powerful modeling framework for problems under uncertainty. To solve them is a P-Space task. The only solution approach to date compiles down SCSPs into classical CSPs. 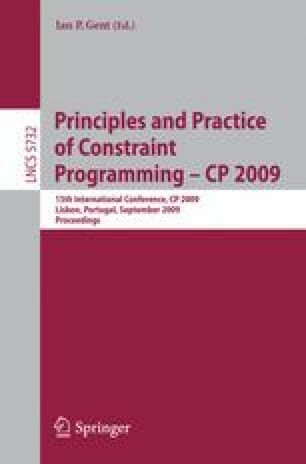 This allows the reuse of classical constraint solvers to solve SCSPs, but at the cost of increased space requirements and weak constraint propagation. This paper tries to overcome some of these drawbacks by automatically synthesizing filtering algorithms for global chance-constraints. These filtering algorithms are parameterized by propagators for the deterministic version of the chance-constraints. This approach allows the reuse of existing propagators in current constraint solvers and it enhances constraint propagation. Experiments show the benefits of this novel approach. Brahim Hnich is supported by the Scientific and Technological Research Council of Turkey (TUBITAK) under Grant No. SOBAG-108K027.